Our Rascal is keen that his sisters (“My Girls”) should have the ice creams they are hankering after, despite the fact that he, Faris, is no lover of ice cream. You are doubtless thinking that this concern for his younger sisters shows a selflessness that is exemplary in one who is not quite four and a half years old. I am sorry to disillusion you, but The Rascal knows full well that in place of ice cream, he will be bought a small toy. Which, invariably, will be Dinosaur Related. Mr B, aka Grandad, takes the Trio, with their mother, up to the beach shops. Faris returns, in great excitement, holding a box in which nestles an egg. It's a hatchery, apparently, according to the box. We need to immerse the egg in water and a baby dinosaur will emerge. Faris drops the egg and it cracks. A small green and yellow blob, which might or might not be a dinosaur, can be seen within. Shall we, I suggest, fill a bucket with water anyway, so that we can see what happens to the rest of the egg? We - Faris and I - set off, hand in sandy hand, to the tap to fill up one of the two large green buckets. On the way, Faris manages to drop the rest of the egg. He does, however, still have the tiny dinosaur clutched in his fist so All Is Not Lost, even though I feel very slightly cheated not to have witnessed the actual hatching. Faris says the green and yellow blob is a Baby Spinosaurus. I am none the wiser but happy to bow before my youngest grandson’s superior knowledge of All Matters Dinosaur. We are on Littlehampton beach which is absolutely buzzing as everyone seeks to fit in one more sun-filled beach day before it's time to go back to school. Mr B missed our recent Family Beach Day because the van which would have transported both him and his mobility scooter down to the seaside would not start for reasons which I am not prepared to share as they do not show me in a Good Light. Today, with the help of the van, the wheelchair and the new portable door ramps, he is able to join us, in splendid form, seated in the Grandadmobile. We feel that our ratio of Tots to Teens is just about right, three of each. In addition, there are four of we proper grown-ups - two of the Darling Daughters, Mr B and I - to provide back-up to Jack, Hazel and Zoë should they seem to need it. The sea is coming in, there is lots of splashing about. The lifeguards keep warning everyone about the dangers of the strong currents and reminding us to keep between the red and yellow flags. It's good to know they are keeping an eye on us, along with the hundreds of other sun-seekers on Littlehampton beach. My sister has texted me, challenging me to send her a photo of today's sandcastle. 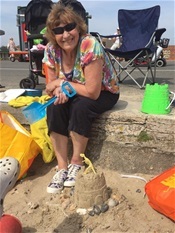 This proves rather more difficult than you might expect because (i) we are sitting at the top of the beach where the sand isn't particularly good for sandcastle construction and (ii) at least two of our company are demolition experts. I solve these problems by fetching buckets of sand from further down the beach (studiously ignoring pitying looks from other beach lovers who clearly think I should be too old for such activity) and waiting till certain backs are turned before I turn out my castle. It is Perfectly Formed, though I say so myself as shouldn't. Tala advances towards it and I think she is going to demolish it - but she carefully makes a star shape on the top with one of her sand cutters. A star for a star. We stand the Bony Dinosaur on the top and add a few stones around the castle, then take a photo quickly before it's too late. My sister will be so proud of me - not necessarily because of the excellence of the castle’s construction but because of the obstacles I have overcome in its making. Six of us take the Boat Train back along the prom (prom, prom) to the car park. “We are Wavers!” announces the Middle of the Darling Daughters - and her Trio all wave, obediently, at passers-by. You can tell we have them well trained. There's only one thing for it. We will simply have to keep coming back - and back - for More Of The Same.